I went to see Star Wars: Rogue One the night it came out. My boss/friend actually wanted to rent out the entire theater because … he’s insane, but after an entire lunch of co-workers telling him that he shouldn’t spend $3,000 on it, he finally relented. Hey, he was excited. And let’s be honest, most of the world was excited – all the teasers, trailers, spoilers, etc. had led to a great deal of hype. Though when I went to see the movie, I couldn’t help but feel underwhelmed (to be honest, I feel that way about the rest of the series as well). It wasn’t that I didn’t like it – I did – but I couldn’t help but feel a little disappointed. That’s been my reaction to the 2016-2017 offseason for the Braves. Fresh off a 68-win season, the baseball-equivalent teasers and trailers were rumors of Chris Sale, Chris Archer, and an aggressive offseason – one that could jolt the Braves back into contention. We’re two months into that offseason, and to this point, I feel a little disappointed. It’s not that it hasn’t been a good offseason – it’s been a mostly positive offseason that makes the team more watchable without doing anything to harm the future – but it hasn’t been quite the impactful offseason I hoped for. We can (and will) discuss whether this was a good idea or not, but I think what they chose to do was valid. The Braves have an impressive overall farm system, but they lack the upper-echelon talent to make impact deals without giving up huge chunks of the depth they currently have. Could they have made a push and contended? Sure. The team has two star players in Freddie Freeman, Ender Inciarte, and Julio Teheran, and they have some near stars in Dansby Swanson, Mike Foltynewicz, and Ozhaino Albies. A playoff run was conceivable with added talent. But the rest of the market didn’t really shape up. Free-agency’s strength was corner outfield and first base, and the Braves have already committed to Freeman, Nick Markakis, and Matt Kemp to those spots. Third base potentially had Ian Desmond and Justin Turner, but they only made sense (especially given the draft pick compensation) if the Braves acquired the starting pitching necessary. And that’s really the part that never materialized – no FA starters worth pursuing and resulting high prices for trades made acquiring a front-of-the-rotation too costly (presumably). So now we have to ask what’s left, and the answer is a team worth watching (and not for lolz) in 2017. Below is a payroll chart of the current roster. Atlanta spent between $105-110 million last season, so there is an increase in payroll, though not exactly a lofty one. They could still spend in a few areas (namely Matt Wieters), but I think the current roster is more or less what the team will roll with. I did a little research, and over the past decade or so, teams have seen an average payroll increase of about 12% when they open a new park – right in line with the current increase for 2017. But what has all this resulted in? How good will the 2017 Braves be? There are three columns – an optimistic projection based on what I think they could optimistically yet realistically do in 2017, a look back at 2016, and Steamer’s projection for 2017 (note: all of these are based on FanGraph’s WAR). I added an average column because I think all three represent a facet of projection – an optimism looking at the potential each player has, a look back at the most recent production that includes some injuries, breakouts, etc., and a look at an emotionally unbiased source of info. The average column tries to balance that out. The end result is about 71-81 wins (Authors note: an earlier version of this had 74-85 wins, but I messed up and had to adjust Adonis Garcia), and I think that’s a fairly reasonable range. 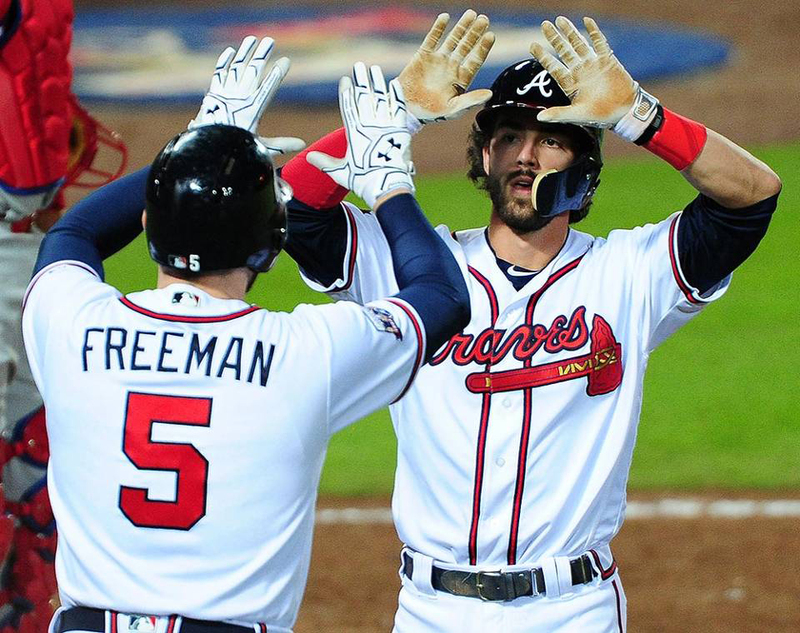 While last year’s team only won 68, the Braves should see improvements at second base, shortstop with a full season of Dansbae, maybe the outfield, and a much stronger showing from the rotation. 13 wins seems like a lot, but when you basically had a bunch of replacement-level players, it’s not hard to make dramatic improvements. There’s also some downside, however, due to the age (Bartolo Colon and RA Dickey) and frailty (Jaime Garcia) of the rotation, the limited nature of Kemp and Markakis, and the fact that third base may be underwhelming again. And that’s why the range of outcomes. And that’s okay. The past two seasons have been borderline unwatchable at times as the team tried to avoid financially limiting themselves and blocking young players, but this team represents a significant upgrade. The rotation is worth watching every night with Julio Teheran as the young leader, Bartolo being amusing by his basic existence, Dickey’s knuckleball, Folty’s big fastball and rising status, and Garcia is perfectly respectable. The lineup is better, and it may welcome Albies (and a resulting shift of Rodriguez to third) at some point. And the bullpen could actually be pretty electric with Arodys Vizcaino, Mauricio Cabrera, Shae Simmons, Ian Krol, Paco Rodriguez, and the return of closer Jim Johnson. So was the offseason a little disappointing? Maybe. But that might be because of the excitement of offseason rumors and not because the offseason was actually bad. It was actually pretty good. It continued the story of rebuilding. It made the team better. It made the organization better. It wasn’t AMAZING, but that’s okay. The 2017 Braves should be worth watching, and the season plays a pivotal role toward the Braves regaining it’s power in the division. That’s just fine. And so was Rogue One.